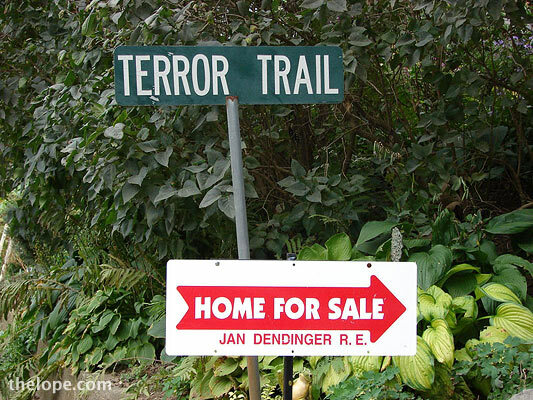 My brother, Steve, shot this this "Terror Trail" photo recently in West Branch, Iowa. He writes: "It's a fake sign, but convincing enough that it got me to stop and take a picture (and, according to the lady who lives there, was part of the directions to a house that was for sale nearby). She says she and her husband put it there because of the steep driveway which could be an adventure in winter." This sounds like a great house for teens to gather and be knocked off one by one. I wonder if it was built on a cemetery.